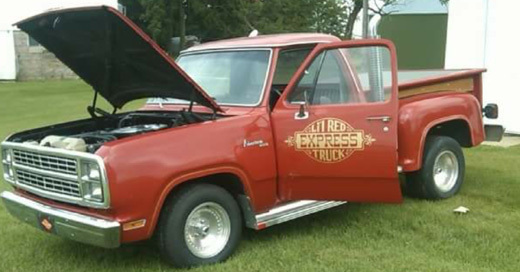 1979 Dodge Lil Red Express Truck. Bought this baby before I could drive. I am the third owner, the second owner was my brother. Still looks pretty good despite being restored way back in 1992. A lot of my high school dollars and went into this truck. I still have the original rims but they need some work so I have had these aluminum ones on it for years. No exhaust, straight pipes. Has a great sound. Used to take her car shows back 20 years ago, but now she’s more of a 30 footer. Still fun to drive though.